Just as you can add apps to the Samsung Galaxy tablet’s Home screen, you can also add widgets. 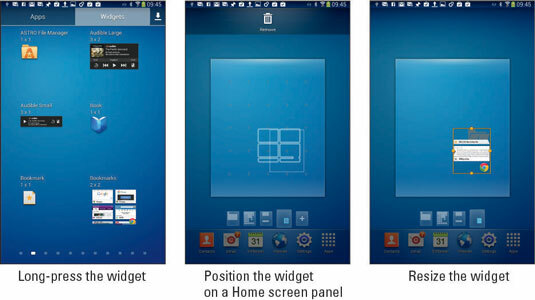 A widget works like a tiny, interactive or informative window, often providing a gateway into another app on the tablet. Touch the Apps icon on the Home screen. Touch the Widgets category atop the screen. The widgets appear on the Apps screen in little preview windows. Pay attention to their size: Some widgets are bulky and can fit only on fairly empty Home screen panels. Scroll the list to find the widget you want to add. Long-press the widget, and drag it to a Home screen panel. The widget is plopped on the Home screen. You can resize some widgets after they’re on the Home screen or anytime. Touch the widget until you see an orange border and then drag your finger on the touchscreen to resize the widget. Touch elsewhere on the touchscreen when you’re done resizing. The variety of available widgets depends on the apps installed. Some apps come with widgets; some don’t. Some widgets are independent of any app. More widgets are available at the Google Play Store. You cannot install a widget when the Home screen has no room for it. Choose another panel or remove icons or widgets to make room.